Portable hair wash and shampoo basins, or as they're also known, portable shampoo bowls, are ideal mobile hair washing solutions for beauty salons, barbershops as well as health and home-care facilities. These shampoo basins can be used as portable shampooing stations, or they can be permanently installed inside of your hair salon, draining into a sink if one is nearby or into a bucket for easy disposal. They typically feature large, work-area bowls; a drain hose that will let you empty water; a plug to keep water from draining out; light-weight design and a height-adjustable stand. 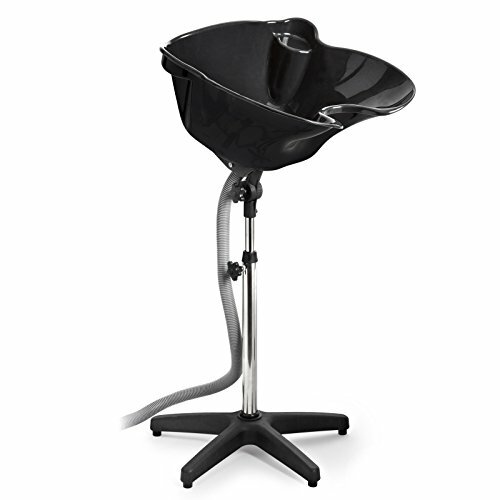 The Saloniture Portable shampoo sink is our top pick- it features a pedestal base, adjustable height, a tilting basin to accommodate standard or reclining chairs, stain-resistant ABS composite construction, an extra-large shampoo bowl measuring 18 1/2 inches from front to back, 6 inches in depth and 17 inches across the basin itself. It doesn't ship with a drain bucket or a nozzle for wetting the hair, but users are pleased with its durability, quality of construction, and its buyers complimented it for making it easier to shampoo the hair of elderly parents with dementia, or special needs children and adults. You will need to spend some time fiddling with it until you figure out the best set up for your personal use, but once you've determined that these are solid and time-saving options for washing hair. Let's take a look at five of the best-selling portable shampoo sink basins on the market today and see how they compare. The Saloniture Portable Salon Deep Basin Shampoo Sink is a portable hair wash and shampoo basin that has some nice features. Buyers liked its extra large and deep basin, strong pedestal base with five legs, adjustable height and that the basin can be tilted so the neck can rest easily as the persons hair is being washed. Another thing many users like about this portable hair wash and shampoo basin is that it is lightweight and rolls extremely easy to wherever it needs to be go to. They also observed that this portable hair wash and shampoo basin is not only portable but it can also be permanently installed if the user decides to use the basin this way. Reviewers who have had or do have their own salons like that this portable hair wash and shampoo basin looks like and works pretty much like any of the standard basins they have in their shops and it’s great if you have clients that might be home-bound. It has plenty of room to work with and is comfortable for the client. The only negative users have voiced is that it won’t drain back into the sink that it is hooked up to and has to be drained in a bath tub. This Best Choice Products Portable Shampoo Basin is a portable hair wash and shampoo basin that has a sleek look to it with its black coated gloss finish. It’s also made of injection-molded plastic which some users say makes it easier to clean and keep clean. Buyers like this product because they enjoy its ability to easily adjust in height up to 54 inches and that it has a good-sized drain hose that can extend up to seven feet. Reviewers commend the depth of the sink because it gives you plenty of room to work with clients, which makes it much more comfortable for both the hair-washer and the client. Buyers also like how easily it drains and that it is easy to take wherever you may need to go- if you are a professional stylist. Some users, however, did seem to find that their portable hair wash and shampoo basin had an issue with leaking. This Saloniture portable hair wash and shampoo basin is similar to their deep basin version but has a shallower basin. However, it still is just as sturdy as the other version and can adjust in height quite easily which is something users tend to like. It also has a sturdy and easy to maneuver pedestal base which makes it easy to move to whatever location that it needs to be placed. 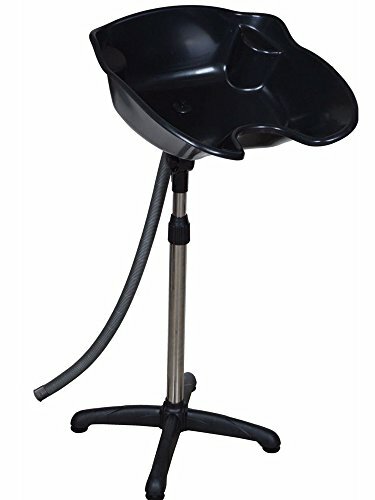 Reviewers also commend how easy the basin on this portable hair wash and shampoo basin is to tilt, making it easy to fit just about any kind of seating arrangement. 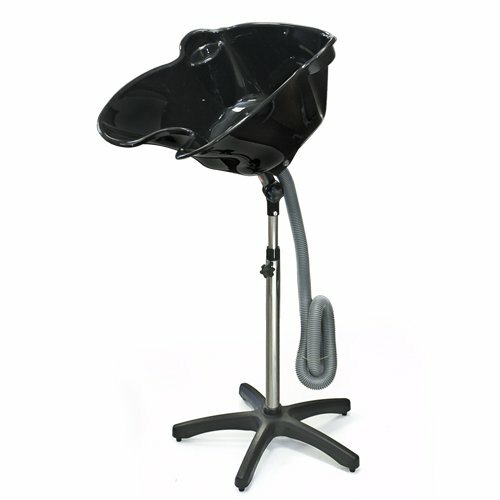 Users like the option that this portable hair wash and shampoo basin can be easily transported to a clients home or they can install it as a permanent fixture in their own salons. Buyers also compliment this particular portable hair wash and shampoo basin because it tends to work extremely well with their elderly and/or disabled clients. The biggest complaint about this basin is that the neck of the basin is not large enough for some clients necks. This TMS Adjustable Height Shampoo basin is a portable option that features a nice-looking basin with its black coated glossy finish. Its buyers like that it is reinforced with stain-resistant plastic and has strong stainless-steel support for enhanced durability. 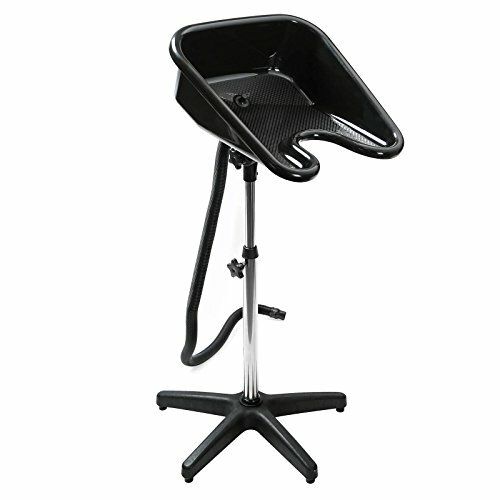 The base of this portable hair wash and shampoo basin is extremely sturdy, which makes it especially safe to work with. Some reviewers like that this unit has its own plug that helps to keep the water from draining out while using the basin. Buyers like the large size of this portable hair wash and shampoo basin because it is almost the same size as the permanent salon sinks, but is still very lightweight so it makes it easier to transport. Some buyers, however, have noticed that their units was not easy to tilt, or wouldn’t tilt at all due to faulty springs. Others were disappointed because they couldn’t get the portable hair wash and shampoo basin to get low enough for some of their clients. This HomeSmith portable hair wash and shampoo basin includes an extremely large work area with its large basin. Buyers like that it gives them plenty of room to work with their clients. With more room there is more comfort for the client. This portable hair wash and shampoo basin is lightweight in its design and has a stain resistant and reinforced durable plastic sink which users like because it is extremely easy to keep clean. It also can be adjusted to 55 inches in height and as low as 39 inches and users say that this works really well for a variety of different clients needs. It has a very stable five-leg stand, which makes it safe to use with just about any client and easy to maneuver. Users also like how easy this portable hair wash and shampoo basin is to assemble- taking no time at all to put together. Many users have commented on how easy it is to use with clients that are wheelchair-bound. A few users have commented that it tends to leak sometimes. Portable shampoo basins offer a convenient and affordable means of shampooing and washing the hair home-bound individuals, people with special needs, elderly parents suffering from Alzheimer's or dementia, or just a general use shampoo basin for a hair salon or barbershop. Hairstylists and cosmetologists often use these as portable hair-treatment solutions- writing that they are able to pack them into a car and take them to their clients homes to style their hair for them. The height adjustability of these portable hair basins is another solid feature- it enables you to accommodate clients of different heights, and also matching it up with chairs of different styles and heights. The shampoo basins will also tilt, which makes it easier to settle the client in for a hair wash, accommodating their particular physical shape and potentially their disabilities, as well. You can attach the drain hose to pipe beneath the sink, or merely have the drain hose drain into a nearby bucket, enabling you to discard the used water once you're done. One buyer describes washing her mother's hair- her mother really dislikes leaning over a sink, and that using her portable salon basin is much more comfortable for her and easier for the daughter to use. 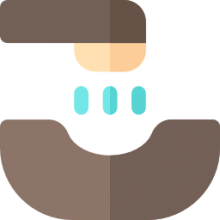 Some users caution not to have the basin fill up too heavily with water, because it becomes more difficult to drain and there's a chance that it will spill over, potentially soaking the client. That said, it's likely that after you purchase one of these portable shampooing basins that you will quickly figure out the best way to configure it for your personal or business use.